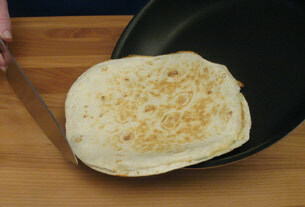 A quesadilla is a flour tortilla, filled with savory ingredients. You can fill a tortilla with lots of different fillings the same way you would choose lots of different fillings for a sandwich. 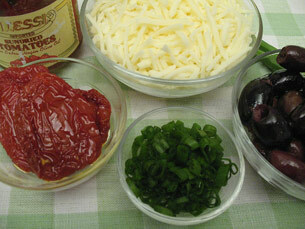 Cheese is very often one of the main ingredients. 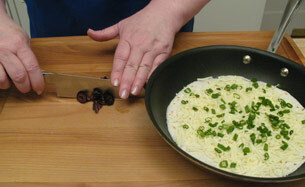 I’m using leftover Monterey Jack shredded cheese with scallions, black olives and sun-dried tomatoes. 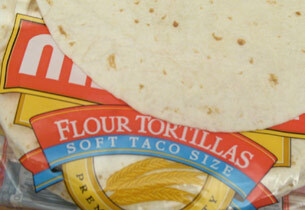 Buy the 8 inch flour tortillas. The 12 inch are just too big to handle. 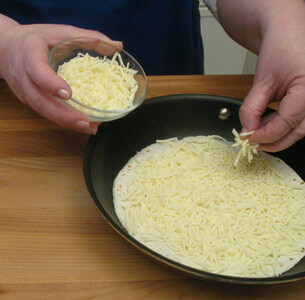 Lay one flour tortilla in a non-stick pan and top with 1/3 cup of cheese. Wash one scallion (green onion). Cut off the hairy bit on the end. 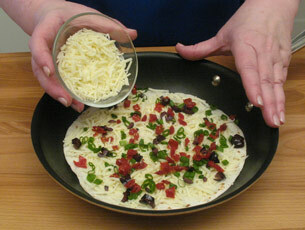 Cut the scallion into quarter-inch slices and sprinkle on the tortilla. 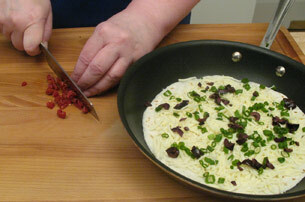 Dice three sun-dried tomatoes and sprinkle them on top of the scallions. And top with the second tortilla. 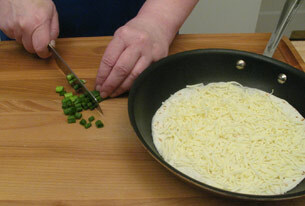 After about 1.5 minutes the tortilla should be lightly browned and the cheese is starting to melt. 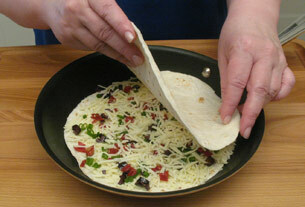 Flip the quesadilla over with a spatula. Cook for about another minute on the flip side. 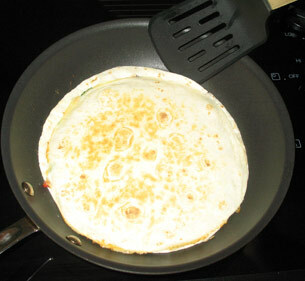 Peek inside the quesadilla to make sure the cheese is all melted before removing it from the pan. You may need another minute or so. Slide the quesadilla out of the pan and onto a cutting board. 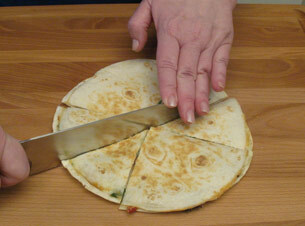 With a large kitchen knife cut the quesadilla into six slices. 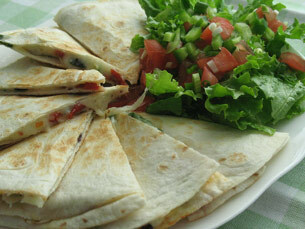 Serve this quesadilla with some salad and you’ve got yourself a perfect lunch or light supper! Not that it’s absolutely needed, but I found that a bit of butter on the grilled side of the tortilla helps in evening the browning and creating a more crisp “crust”. If you want a more traditional quesadilla just use some leftover chicken sprinkled with some fajita seasoning and some lime juice. Or, get rid of the leftover turkey by doing the same. A brush of butter or oil on the tortilla does give it a nicely browned and crispy finish but, on very rare occasions, I do like to try and save a calorie or two! Would anyone care to tell us a bit about â€œfajita seasoningâ€? This was awesome how you did step by step. Thank you this is going to be very helpful with the ingredients that I’m going to need and when I make dinner tonight. Thanks Tanya! 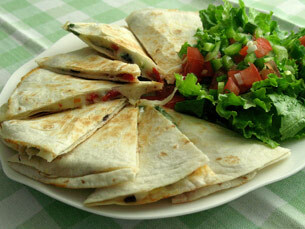 Quesadillas are a great “quick” meal that everyone loves! Super easy! Thanks for the recipe. I can’t believe it is so easy to prepare. Thanks Nasir for sharing what sounds like a great recipe! Quesadillas are a great way to use up leftovers.